Personalized Double Arch Home Address Sign - - graceful heart shape top edge adds a touch of whimsy to the usual arch silhouette. Available for wall mount or with two optional lawn stakes. Made in USA. Choose the one-line style to display the house number only. Choose the two-line style for number and street name. The one-line sign style holds up to five 4" numbers. The two-line style holds up to five 3" numbers on line 1 and up to 17 characters on line 2. Please be sure to type all personalization exactly as you want it to appear. If you are not using optional line 2, leave input box blank. 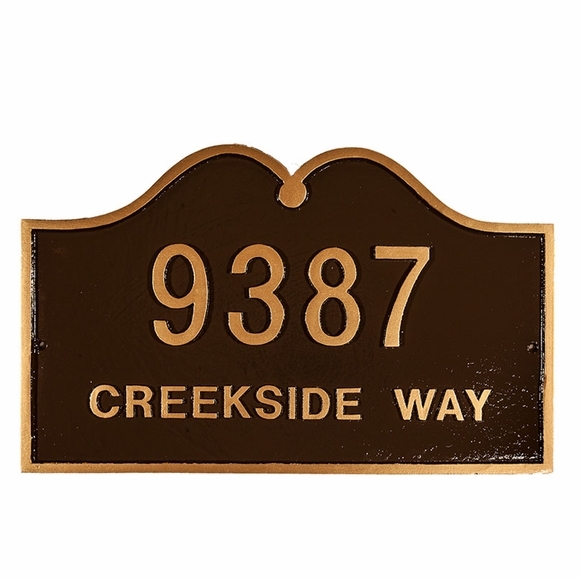 Unusual double arch address plaque with one or two lines of personalized text. Made in USA. Looks great for my new beach house, will definitely buy again for my other properties, it's a great house warming gift as well, great quality.